In the final episode of Flux podcast for 2017 I sat down with Dean Kamen, engineer, businessman and inventor extraordinaire. As an undergraduate, Kamen developed the first portable drug delivery device, a wearable infusion pump. Today he spends much of his time running DEKA, his New Hampshire based company, which has been focused on R&D since 1982. DEKA has helped develop the portable dialysis machine, the vascular stent, the iBOT a stair-climbing wheelchair, the Slingshot water purifier and the Sterling generator. 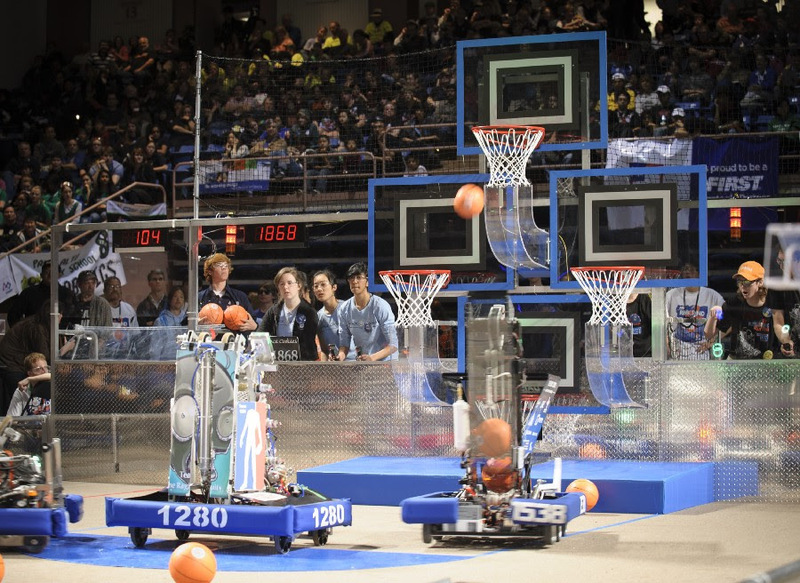 Kamen is also behind FIRST, the non-profit behind the successful robotics competitions which last year saw half a million students participating. Most recently he was awarded $300 million and is building up ARMI to focus on regenerative medicine. These days Kamen may be best known as the inventor of the Segway, that two-wheeled personal transport wonder that launched 1,000 internet memes. He explains why interdisciplinary exposure and freedom to tinker at the edge are so critical to human progress and why the business community, government and technologists need to move from focusing on short-term wins to creating long-term value and solving real global needs. He also shares why he thinks the world is headed for catastrophe and what we can do to ensure that in the race between education and catastrophe, education wins. AMLG: Lets begin with a day in your life. You have a million day jobs and projects going on. How do you organize your time? DK: I could try to act like it’s organized and planned and I actually control my environment and my schedule. But none of that would be true. I’ve never had a business plan in my life. I’m unorganized. I don’t schedule much of anything. I react to the crisis of the day when things are going wrong. Or I seize the opportunity of the day when things are going right. I try to connect disparate resources and people that I realize might be powerful and successful in some way at doing what they’re doing, but are unaware of how much impact they can have by short-cutting the development by some other industry or some other company to do it, if they just knew about each other. 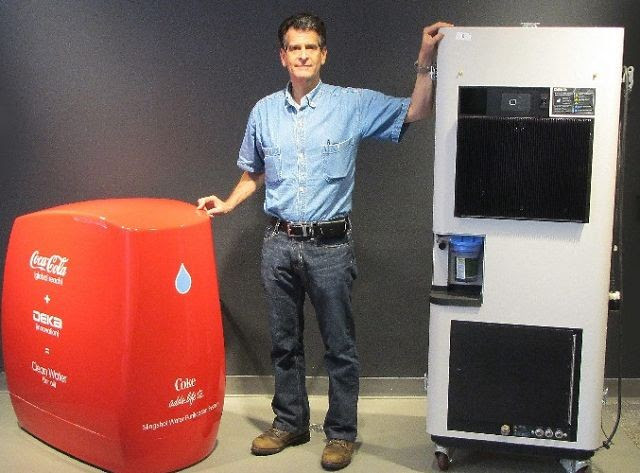 DEKA partnered with Coca-Cola to distribute the Slingshot water purifier in the developing world. For instance you talked about our water project. We spent years building a vapor compression distiller a small portable device that could make clean water out of anything. That was the easy part. It was just physics and thermodynamics. But how are you going to get it all over the world? It’s arguably a medical device because the number one killer of kids worldwide is simply no access to clean water. Medical companies aren’t going to start doing that. They don’t have the resources to go to most of the developing world countries with expensive medical products. But the Coca-Cola Company has the largest global footprint of any company in the history of civilization. So let’s go work with the Coca-Cola company to deliver a critical healthcare need. AMLG: Tell us about DEKA and your latest research there? DK: I was recently summoned to the White House where they announced that my little company DEKA was going to receive an $80 million dollar federal grant to be matched by well over $200 million dollars in funding to create a whole new industry in regenerative medicine. Over the last few months we’ve been scrambling to put together an organization that will over the next five years deploy this $300 million dollars such that by the end of it we believe we’ll be making at industrial scale cells, tissues, skin and bone, and whole organs — kidneys, livers, lungs — to meet the desperate needs of people that need organ replacements, for which there will be no reasonable supply of donor organs. All the complications of taking a donor organ typically leaves you needing immunosuppressives for the rest of your life. What if we could literally print pieces of an organ and a scaffold for it, then reintroduce to it induced pluripotent stem cells from the donor, who then becomes the recipient? It’s sort of like I can replace your old worn out part with a new one from the original equipment manufacturer — your mom and dad — because it will have your DNA in it. AMLG: Most of what DEKA has done so far has been in the mechanical engineering sphere. How did you get into the bio side of things? So we did a search of our own around the country to see what was the state of these miracles and petri dishes. And we realized that if we can bring some engineering discipline to the whole community, we probably can dramatically accelerate the rate at which these miracles leave the world of science and become part of the world of industry to meet the needs of the American public. AMLG: If you go back in evolutionary history, amphibians were able to regenerate. They then evolved into mammals who lost that ability. Science is finding that some creatures have been able to regain that ability and people are thinking it will be possible for humans. Our livers are already able to grow themselves back. Do you think it will be possible for humans to regain that lizard-like capability to regenerate, and is this any part of what your regenerative medicine group is looking at? DK: What I can tell you is we now have, in this regenerative medicine cohort that we’ve put together, 26 different world class university medical school affiliated research centers. They’re all on our team in one way or another, and they all have examples of being able to regenerate cells, tissues, entire organs. They’re each screaming ahead towards understanding the mechanism of action by which they can make that more realistic. In fact it now is relatively straightforward to take adult cells from your skin, and through a process turn it into what’s called induced pluripotent stem cells, we can take your adult cell that decided to be an eyelash or a fingernail or hair or liver and turn it back into a cell that when put in the right environment will still be your cell with your DNA. It’s you. But it will start growing itself to become what you happen to need, a new kidney or a new lung or more skin or you name it. The understanding of how to do that and how to control that is leaving the realm of science fiction and becoming the realm of science. We want to turn it into the realm of high-volume, high-scale access for people that need it. AMLG: With so many disparate projects going on at DEKA, I’m curious how you structure the workplace. Is it an open floor plan? Do hardware and software sit together? Is it top down or bottom up? Do teams set their own direction? How do you organize it all to inspire creativity? DK: Personally I don’t think whether they’re all in one room or separated makes a big difference. We’re in a bunch of magnificent historic old buildings along the Merrimack River. The Millyard was once the largest single operating industrial complex in the United States. When textiles became a commodity the Millyard suffered and the buildings ended up nearly empty. I moved up there from New York and saw it as a golden opportunity to revive them. I thought if we turned them into a neat space to do R&D it would be a great attraction to young smart people. My office is halfway between Dartmouth and MIT and Harvard. It’s just a good place. But maybe the real answer to your question, how do you organize people to be creative? I don’t know. I don’t know how to make people creative. But I know what can take that out of them — a big top-down infrastructure that’s well organized. I don’t say that to be pejorative. Society depends on big, well-structured, well-organized things. You like to know when you flip that switch the light will come on. You like to know when you turn that tap that the water coming out is safe. You don’t want to give it another thought. To have organized societies we depend mostly on big systems that do things consistently and reliably. In fact we measure quality by how consistent things are. The trouble is an unintended byproduct of well-organized large organizations is that while they snuff out anything that might be a change, which might be bad, they also snuff out anything that might be a positive surprise. Which is why big organizations always struggle with trying to be efficient, well-organized, scaled up, but also innovative. I don’t have an answer to that, so my solution is don’t ever become big. I said, I will keep populating my little company with the kind of people that like to live on the edge. That don’t mind failing, picking themselves up and trying again. I said, if I can keep an environment where people can work hard, fail fast, learn from it, get get up and keep moving until we have something that we know is ready for scale, then — instead of building out a whole global organization to meet the needs of something at scale, which would take everybody’s time — take that thing and give it to these big organizations. Who may or may not have a tolerance for the risk and wouldn’t have liked the 10 times we failed and wouldn’t have been able to have people in that environment with the confidence that they can fail and keep going. But they are big. They have a global reach. They are disciplined. They understand scale. So give it to them. Get a little royalty or share in the upside with them. Then use what they give us back as the the fuel for our next project. DEKA has worked for a lot of giant companies. We’ve made a lot of products that have reached scale. But we have nothing in the world that says DEKA on it. 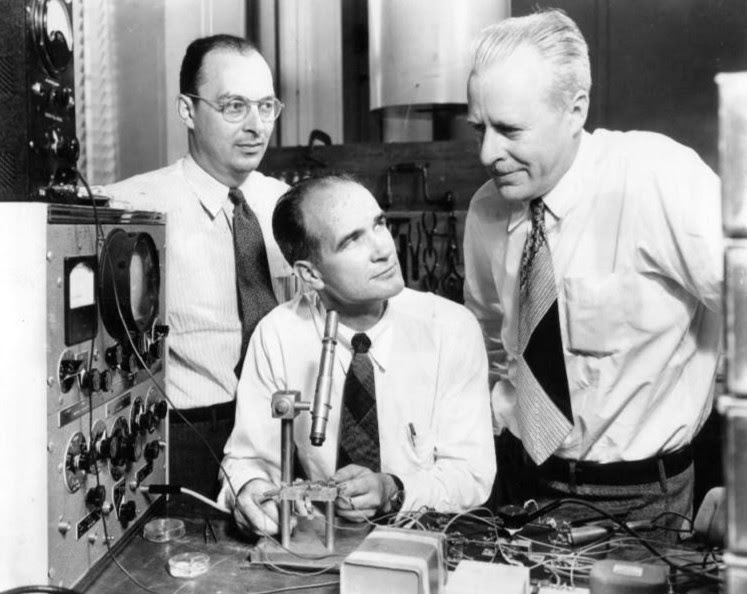 In 1947 Bardeen, Brattain and Shockley invent the transistor, the building block enabling many digital technologies including portable radios, touchtone phones, computer microchips and color television. Also invented at Bell Labs: data networking, the first binary digital computer, solar battery cells, the laser, communications satellites, Unix operating system. AMLG: Yes Shockley. For listeners who don’t know, Bell Labs was behind many innovations like lasers, transistors, the silicon solar cell, the computer operating system Unix, feedback. And Claude Shannon the father of Information Theory. One of my favorite stories about him is he would ride his unicycle up and down the hallways, he juggled, and he had a lot of fun side projects like the electrical mouse that navigated through a maze. I guess my point is that all these people were thrown into one building. Chemists, mathematicians, engineers, physicists. They were encouraged to exchange ideas and were given time to pursue their own investigations without concrete goals or deadlines. I’m interested what you take away looking at that? Do you think that can be reproduced or was it a one-time thing, and when you look at corporations who are trying to do this now, the modern day Googles and Google Xs, do you think they’re doing a good job? DK: The only thing I have in common Shannon is, I ride a unicycle. DK: But you mentioned a bunch of interesting organizations that I have involvement with. I was on a two-hour board call with the folks at Berkeley night before last. Because Paul Jacobs, the CEO now of Qualcomm, helped them build a whole new piece of their engineering school the Jacobs Institute. The goal of which is to figure out how to make engineering innovation more relevant and exciting, at the level of teaching it. There is so much evidence that schools have been efficient at making isolated courses — electrical engineering, mechanical engineering, and even within electrical engineering you’ve got hardware, software, analog, digital. But most innovation comes at the intersection of technologies and ideas. Schools are good at giving you the basics. I’m not against schools. I love schools, I love education. But schools tend to be about analysis — here’s the situation, here’s F=MA. They’re good at explaining what we found out, what we learned what became a law. That’s analysis. Break everything down so they understand it. Analysis is great. But the opposite of analysis is synthesis. Let’s build something new. Schools aren’t there to teach you how to do synthesis. Some people do it naturally. The inventive type — why can’t I try this way? But that’s not generally taught. And I’m not sure if it is easy to teach it well. To your point, I also would like to have been a fly on the wall when people like Shockley were walking around. When people were looking at background radiation and wondering what is this stuff? And how big is the universe? By the way Galileo worried about that 400 years ago. Curiosity-based research, to people who are looking at the near term, always seems like a distraction or a waste of time if you’re a business type. But in the end, with hindsight, everything that seemed like it was just somebody off doing something crazy in one generation turns out to be the core of an entire new industry or an entire new field of science and understanding that we have today. DK: To which his answer was, “your Highness, of what use is a baby?” Obviously all of modern electricity, magnetism, motors, generators, communication is based on that. In any generation people that are tinkering with something that’s not yet at scale and isn’t yet part of life, in a product or service, people easily say it’s a distraction. But all progress depends on people pushing the edge of what we know, doing things that may not have an obvious application to life as we know it today. But they will literally determine what life will be like in the future. AMLG: It sounds like tinkering and interdisciplinary exposure is critical to get these crazy outcomes one wouldn’t expect. I wanted to ask about Intellectual Ventures, started in 1999 by Nathan Myhrvold, who ran Microsoft’s research division. He wanted to see whether the kinds of insights that lead to invention could be engineered. So he formed IV, with all these people coming together in a room for “invention sessions.” Do you think if you cram a ton of PhDs in a room to brainstorm you can get a multiplier effect? AMLG: So he copied you? DK: Well I wouldn’t say copied us. But we were all out having a fun weekend, and they realized DEKA really does have a business model — as students at business school say today — which was to do the inventing and leave the scale to other people. He was fascinated by that. He’s a brilliant guy and surrounded himself with other brilliant people and they said, how can we take that model to the extreme? Let’s get all sorts of smart people in a room and figure out if we can turn invention into a well-defined process. They’ve had some successes with that. In general though invention is a messy proposition. You said, well what if we just put a bunch of PhDs in a room? Being a PhD certainly doesn’t hurt in having deep, well-defined knowledge of a particular subject. That can be useful or at least getting access to people that have that knowledge is useful. But I’m not sure that it’s the PhDs that are likely to come up with the bold new ideas. Because again, education, which is what gets you a PhD, is analysis. It’s a deep, thorough, breaking down of everything we know. Whereas invention is synthesis. In many ways I think it’s the opposite. Some of the best inventors I know didn’t have a deep knowledge of any particular technology. They had a deep understanding of what the need is and what we would today call intuition — because we don’t know at the granular level what intuition is — they’d have an intuition about how to solve the problem and then they might go to PhDs for help in implementation. I think invention is maybe like love. Everybody wants to have it. Nobody knows what it is. It’s an amorphic process. The public has an overly simplistic view of inventors. They suddenly have this brilliant vision and they go running down the street saying,“eureka I’ve got it!” Invention is an iterative, frustrating process in which you keep finding all the wrong ways to get to where you wanted to go. You back up, try a new route, hit another stumbling block, fall down. Eventually you integrate enough of the ideas that might have should have could have would have worked into something that actually does work. Then the world sees it and think it was a straight line from your idea to that solution. That there was instant clarity. As opposed to this iterative, long struggle. AMLG: Right — a lot of failures and a lot of squiggly lines on the way to the eureka moment. DK: Except for me. Everything always happens on time, ahead of schedule, under budget and works on the first shot. Ha. 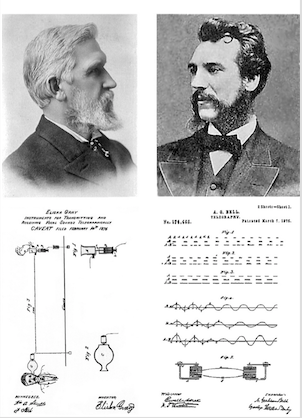 On February 14th, 1876 Elisha Gray (left) and Alexander Graham Bell (right) both filed telegraphy patents. AMLG: Haha. One thing I’m curious to ask is about the idea that inventions come in multiples, that people tend to have the same idea all at once. Which points at this foundational, iterative, long process. “The Calculus Wars” describes how Newton and Leibniz both discovered calculus at the same time. Color photography was invented by two Frenchmen at the same time. Five people came up with the steamboat. Nine people came up with the telescope at the same time. Alexander Graham Bell had a simultaneous discovery — Elisha Gray also worked on the telephone and they filed patents on the same day in 1876 for the telephone. Are some inventions inevitable, are they waiting to happen? Are they the product of an intellectual climate of a specific time and place and build up? Are discoveries, rather than being in our heads which is the general perception, rather are they in the air? DK: On that subject I happen to have a strong opinion and I think you’re already biased by pointing this out. I unequivocally believe that most invention is the intersection of basic science or basic capabilities that have been smoldering along in development for a long time, maybe for a different application. The world sees them, enough people see them and then it’s only a relatively small increment to put them together in a way that makes this “new invention.” You mentioned all the examples except the airplane. People were starting to understand that heavier than air machines could work — birds work, if their wings aren’t flapping they fall down. Right. We act like it was a shocking thing. Well there are things up there that are just floating like bubbles because they’re lighter than air. Birds fly. But when you calculate how much energy it would take to keep something the size of a human being up there, we’re kind of big and heavy, you’d need gigantic wings. How are you going to power them? But at the same time people were understanding what we now call aerodynamics. The gas engine was being developed. You talked about Elisha Gray and Graham Bell. Well the telegraph had been around for decades. People had finally figured out, you close a switch and an electric current moves through a wire at the speed of light and if you let it go a mile or two it still goes essentially instantly at the speed of light. Because there’s a current in that wire, it pulls down a switch and you hear a click and we can do that multiple times, and we call that a telegraph. If you just replace the mechanical switches that go click click click — you have to decode them very slowly — if you put a membrane at each end of that set of wires and you let it vibrate in a magnetic field or an electric field, that electrical information will also travel down those wires to the other end. You replace the click click click of a telegraph with “Watson come here I need you.” It was because of the Amperes and the Faradays, all the people who made it clear how electric fields and magnetic fields and electric currents and batteries work, that first made it into a telegraph and eventually made it operate at human voice scale and now of course at Internet speed. All of these things that are “inventions” evolve when the background technologies become well enough understood and well enough available to the inventor community that they become practical tools. Once they’re one of your tools you can build with them. These inventions are the result of capabilities created by core technologies that evolve over time. AMLG: So it’s the fluency of what’s around us, of our tools as you as you put it. If you’re a teenager these days there’s a lot of resources available to build an on-demand app. A disappearing photo app or a social media app, which is what people are calling innovation. Software is easier to scale and people also see Mark Zuckerberg as an example of success. By contrast, as Ben Horowitz puts it, there’s a hard thing about hard things. You’ve said you think technology is being squandered on quick buck applications and that people are defaulting to the short term. How do we get kids who are glued to their cellphones more interested in science and technology? Perhaps this links to the work you’re doing with FIRST. DK: FIRST is a not-for-profit organization. The letters stand for For Inspiration and Recognition of Science and Technology. A lot of people in this country believe we have an education crisis. My mom’s a teacher. You and I both know there’s great teachers. We don’t have an education crisis. We spend more on education than the rest of the world. We have a culture crisis. We have kids that are obsessed and distracted by other things. I said, if we can get kids as passionate about science, technology, engineering and inventing as they are about kicking a ball, bouncing a ball or being on stage. If we can compete with the excitement of sports and entertainment but have the content be tech, we would change the perspective of kids, particularly girls. So I started FIRST as a not-for-profit. 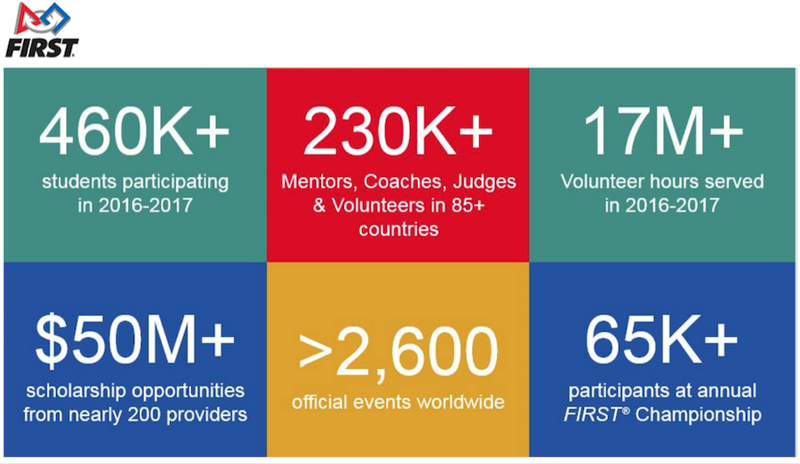 It’s now grown to be 50,000 schools, more than a million kids, 140,000 volunteer mentors working with kids, building robots to have fun competing in an after-school activity that rivals any other sport they could participate in. Except every kid on a FIRST team is developing the skills to become a pro. Founded in 1989 and based in Manchester NH, FIRST is a not-for-profit public charity designed to inspire young people’s interest and participation in science and technology, and to motivate them to pursue education and career opportunities in STEM fields. One of the reasons I started FIRST was I wanted kids to see how exciting and accessible science, technology, engineering, mathematics, inventing are. Yes they’re frustrating. But the wins you get by finally understanding that idea, or the win that comes when you realize I can build that, I can do that, I can understand that — is so powerful. It hooks people to devote their time and attention to things that will give them career opportunities in a world that will soon have few career opportunities for people that might 100 years ago have been able to do just fine because they had a strong back. Or women that could have done just fine if they wanted to do things by rote and sit at a desk and do what we now call mindless tasks that are better done by a simple machine or a computer. It’s mutually beneficial to society and to kids to keep raising the bar for kids’ passion and understanding of technology. To your other point — sadly the attention span, not just of little kids that are multiplexing between their phone and their TV and whatever, but the attention span that has been compressed in the business community, who wants their quarterly numbers, or the attention span of government, that doesn’t seem to be ready to make long-term commitments, whether it’s infrastructure, education or basic research. It’s hurting us that people now have a short attention span. They focus on doing projects that by definition are only incremental because all they’re doing is reassessing and reapplying things they know how to do, but slightly modified. This app versus that app. I don’t want to be judgmental about that industry or another industry. But I have to tell you, getting up in the morning to work hard at making the Nth new video game isn’t exciting to me. Whether I could succeed at it or not, whether I’d make money at it or not, isn’t as important to me as working to help a person that has diabetes or needs a liver or a kidney. Or a kid in some far off place whose biggest problem today is they don’t have access to clean water. Frankly, too many kids in this country that do get these powerful tools and are able to develop systems, they take the easy road of developing products that might have a short-term win in it for them but don’t have a long-term value to society and to the world. AMLG: Speaking of short time versus long term, what do you think of folks like Elon Musk who are becoming heroes to some kids and really thinking of the long term, Mars type expeditions? DK: Elon’s another guy I’ve known a long time. One thing that distinguishes him is that most inventors that stay in control of their technology to create a whole business, since it takes a long time typically, do it in one industry. Or they do it once. You create a company, that takes a long time. Elon went from things like PayPal, which is primarily a software to, Let’s go make electric cars. Let’s go do Solar City. Let’s go build rocket ships. He has to be given credit for the fact that he has gone from industry to industry. He’s bet the farm with a lot of his own resources, which a lot of people aren’t willing to do. Elon has demonstrated the willingness to put his money where his mouth is. Over and over again. You’ve got to give him credit for that. AMLG: I want to go back to you. Since we’re talking about what inspires kids I’d love to hear what were you like as a kid? DK: Right. I have an intuition about them. It takes years and years of thinking about them and rethinking about them to get there, and that doesn’t make you a good student. So I didn’t like school. I always felt dumb because I couldn’t just regurgitate things. I always felt like it was passing me by and I couldn’t keep up. AMLG: Did you invent stuff as a kid? What was your first invention? DK: My first invention never made it to the big time. When I was young I shared my bedroom with my older brother. I was probably five, he was eight. It turned out my mom still had this peculiar idea that every morning we should make our beds. I remember saying to her, well listen it’s my bed and I don’t mind that it’s ruffled up. In fact when I get back into it tonight I’m just going to ruffle it up again and while I’m not in it I might as well leave it pre-ruffled. It’ll be better. At the end of most of those discussions what a mom says is, well you are still going to make your bed. And you’d say why and she’d say because I’m your mother. I realized that when I made my bed with my brother it was easy. He would stand at one side, I’d stand at the other and we’d say pull and the covers would go straight. Then we’d run to the bottom edge of the bed, do the same thing and be done. But when you have to make your own bed, as we all know, you can pull a string but you can’t push it. I was small, I was barely the height of the bed and running all the way around the bed from one side to the other, and if you pull too much you have to go back. I remember seeing my mom put clothes on a clothes line from the second story of the house. Because it had a pulley, 20 feet away on a pole in the back yard, she could get it all the way across the back yard from one position. I went out, took the pulley down, attached it to the corner of the bed, tied knots in the covers, put the strings from the pulleys so I could stand at one corner of the bed, pull on the cover, pull on the ropes to the pulleys and… puff I could make my bed as easily myself as if I had my brother there to help me. AMLG: So it was an automatic bed maker? AMLG: And you had cheated on the bed making. DK: She wasn’t happy. So that product never made it to the big scale. AMLG: I’m picturing a Wallace & Gromit home, where you just slid out of bed into your trousers and the jam hits the toast. Was it something like that? DK: Well the most interesting thing I ever did in my parents house — and it’s become folklore but I assure you it’s true — was when I had gotten into high school and started my little businesses, including building the medical devices you were talking about, for my older brother who at the time was an MD-PhD candidate in med school. I had filled my parents basement with oscilloscopes and voltmeters and electronics and all the stuff you could carry into a little house out on Long Island in a little neighborhood. But when I started needing more than electronic stuff… I needed a milling machine and a lathe and drill presses and saws. Well they’re too big and heavy to carry down the hallway down a wooden set of stairs to the basement. And the basement was already full of electronics. But the house, which was on a footprint concrete basement — was probably 20 feet by 30 feet, but the back yard was another 60 feet. All this underground space under that backyard was a complete waste. Well, what if you could dig a hole in the backyard as deep as the basement, then you could have a boom come in and lower full machine shop equipment into this new space, bash a hole in the foundation wall, so it’s connected. In order to get the wall bashed, the house had to be lifted off its foundation. But just for a week or two. I was convinced my parents wouldn’t think that was a good idea. My little business was doing well enough, my mom was a teacher so she had the summer off. I bought my parents tickets to take a cruise. Drove them into the city, put them on a boat. By the time I got home, beautifully on schedule, a guy with a great big bulldozer was there. AMLG: So you built a basement under the garden? DK: I built an entire new basement for the house by lifting their house up and putting it back down. It worked like a charm. AMLG: That’s quite a feat. It seems like you’ve done so many fun things. You’ve had such a rich life full of experiences and people and pulling all these things together. What is the least known fact about you? DK: I’m always flattered by people describing me even as you did. An inventor or this or that as if somehow I have truly unique skillset. Truth be told I’m a slow reader. I’m a slow thinker. If you spend time with me you wouldn’t think I’m a particularly smart guy. I work all day. I work all night. I work all weekend. I get obsessed with something and don’t give up till I’ve figured out how to do it. It might take days weeks or months. When I finally deliver it, people think I was really smart or did something that they couldn’t do. I don’t think people realize there is no easy way. AMLG: Is there anything that keeps you up at night. Is there anything about the future that scares you? DK: There are lots of things about the future that scare me. You could sum it up right now and say the world is in a race. I say that to all the kids at FIRST. That’s why I want the FIRST community to be bigger. 83 countries have teams now, it’s growing to become a global network. But I tell all these kids the same thing: whether your particular issue is global warming, or food, or water or cybersecurity or healthcare or pandemics, where are we going to get energy — pick your potential crisis. I tell these kids as we’re pushing nine billion people, many of whom will have incredible capabilities, powers due to technology. Some will use that power as a tool and some as a weapon. Some people have nefarious goals. I tell these kids that’s the world you’re going to inherit. I think the world is heading for various potential catastrophes. The way to avoid those catastrophes is education. Both the education around the technologies that we need to deal with global warming and water and food, but also the education to give them the sense and the priorities and the perspective and the courage to use technology as a tool, not a weapon. I tell these kids assume you’re in a race between catastrophe and education. We want education to win. You better be in that race and you better understand that your competitor is nipping at your heels. That’s the way the world is. AMLG: And that technology can be used for many things and catastrophe is one of them. DK: Yes, whether it’s manmade or natural. You asked what keeps me up at night. There will be a never ending set of potential catastrophes that confront humanity and the way we will avoid succumbing to those catastrophes is well-educated kids that have the appropriate perspective and judgment as to how to use that education and their technology for good. AMLG: For people who are listening, what can they do to be helpful to FIRST and get involved? DK: FIRST is entirely volunteer driven. We have 140,000 people — engineers and scientists — that dedicate their time to being mentors for these kids. We make it fun. We have over 50,000 schools involved. Parents that want to give their kids a taste of something that will excite them should get them into FIRST programs. We now start with Junior FIRST LEGO League for five or six year old kids, then FIRST LEGO League, then FIRST Tech Challenge for middle school, then FIRST Robotics for high school. New York City has a huge FIRST population. We’re sponsored by some of your bigger financial institutions, not engineering companies, although engineering and technology and software is critical to all of your financial institutions, as it is to most industries now. FIRST is growing, but it needs to get to where it’s accessible by every kid, in every school, particularly in the New York area. Any responsible parent could be putting pressure on their school — hey let’s get a team going! It’s cheaper than football or basketball and unlike other sports. Every kid on every team can turn pro. And FIRST is equally appealing to girls as to boys. I’d say to companies in this city, if you want to help create your workforce of the future and your customers of the future get involved with these kids now. In America, you get the best of what you celebrate. If we don’t start celebrating science technology and engineering in this country, in the way we celebrate the Super Bowl and the World Series and the Academy Awards, we will be a country that for a while will still just export sports and entertainment. If we can convince this generation of kids that science and engineering and inventing is way more fun and way more accessible and way more likely to lead to careers than bouncing a ball… Look I love sports. They ought to do it. We call it the national pastime. But it can’t become as it has in many cases the national obsession. Sports and entertainment should not be crowding out the ultimate adventure that kids ought to be on as they grow up: thinking, taking abstract ideas and turning them into real solutions, inventing is an exciting thing to do. AMLG: What kid doesn’t start out rigging their bedroom? I think everyone’s rigged their bedroom at some point or put stars and planets on their walls. So that interest is there, it’s often fundamentally there. It’s about keeping kids interested along the way. DK: Every kid wants to be FIRST. You get kids there and they stay. They stay from the moment they see it for the first time. Sometimes particularly girls are intimidated. “I can’t do this. I don’t know how to do this.” Or they think it’s too geeky or boring. And the first time they put this wire to that thing and this motor does what it was supposed to do, or that machine jumps ahead, or that code turns that light on, all of a sudden the empowerment that kids have when they see that they can do this stuff changes their perspective about the world. AMLG: Where do you get your passion for giving back? That made complete logical sense to me. As I started being successful in business I realized as he said, everybody should give back a little more than they take out. I take out a lot. I know that. I have my island. I have my airplane. But if I can build water systems for the world, if I can create a global network of millions of kids that will have careers to solve the world’s problems, if I can supply dialysis to people that would otherwise be gone. If I can make solutions for other medical needs. Then I don’t have to feel so guilty playing with technology. And frankly I use my airplanes and my helicopters to more efficiently go to more places to do more projects. AMLG: It seems you’ve given and put in 100 times more than you’ve taken out. From the outside it’s clear you’ve touched so many people’s lives. Thank you so much for coming and chatting today I really appreciate it. DK: You’re very welcome. Get your listeners to go look at FIRST! AMLG: I will and I will sign my little brother and sister up to do it. They’re 14. They’ll love this. Thanks Dean.